In case you get to the Tagbilaran City Airport to find the air facility closed, do not panic. Instead, compose yourself, pick your trusted tricycle driver and ask the driver to get you to Dao Integrated Bus Terminal where the airport air-conditioned shuttle buses stop. Or, you can just wait for the bus to get past the Port of Tagbilaran, the Plaza or Dauis Junction and catch a ride from there. 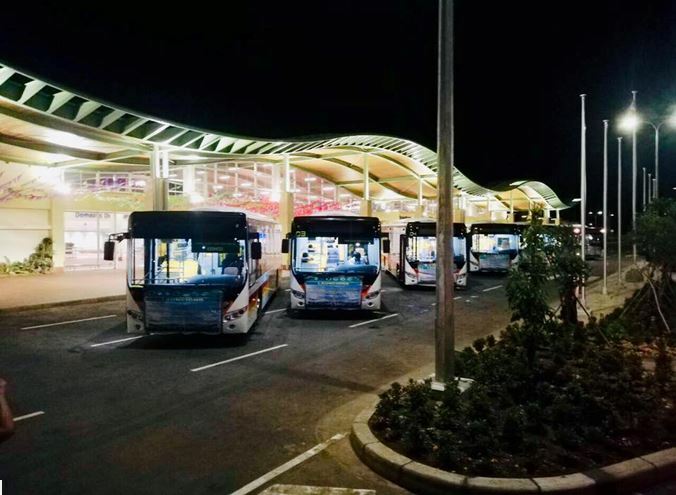 The Department of Transportation (DOTr) has provided these buses to facilitate the transfer of passengers from the airport to the city terminals and then to the port and back to Panglao airport, to Alona and them through the Panglao Circumferential Road on a looped service, for 40-50 pesos. On the other hand, it would finally be different mornings from then on to residents near the Tagbilaran airport, the unusual calm which only happens during ill weather would now be permanent. Gone, starting 6:00 PM November 27 would be the shrieking jet engines warming up, or the sonic booms that could usually bust lightbulbs in nearby houses as each departing plane wiggles its tail for their goodbyes. Civil Aviation Authority of the Philippines (CAAP) has issued the Notice to All Airmen (NOTAM) that the Tagbilaran City Airport has been closed for operation effective the last flight November 27, 2018, and the has been transferred to the new Bohol Panglao International Airport (BPIA) effective November 28, 2018. And as the last plane, Philippine Airlines flight 2778 flew off Tagbilaran City’s runway C1/17-35 and disappeared over the tall Maribojoc mountains to Manila, the control tower lights dimmed and finally sent out the flight plan for Air Force 1 leading it to the controllers of the new PBIA. Onboard AirForce 1 is President Rodrigo RoaDuterte, who would be leading the unveiling of the airport markers signaling the opening of the new facility that would be Bohol’s latest ace on the sleeve in tourism arrivals. As Tagbilaran City’s runway C1/ 17-35 closed, the NOTAM consequently opened BPIA runway 03-21. The opening of the BPIA now elates pilots. Any delays in Tagbilaran City aiport’s last flight at 4:00 PM could spell a whole lot of problems. Operating as a sunrise to sunset airport, any flight delay would detain the last flight, for safety purposes. Not only does Tagbilaran City airport keep one of the shortest runways in the country at 1.8 kilometers, the absence of navigation guides makes keeping the plane grounded a prudent call for even the best pilots. At the new BPIA, aside from a longer runway 03-21, the new P 8.9 billon features state of the art Instrument Landing System (ILS) that even pilots of lesser flight hours will find the runway throroughly sufficient, and without any obstruction unlike the tall buildings in Tagbilaran and the Dayo Hill or Maribojoc Mountains. In Tagbilaran, a where a touchdown forces the aviators to immediately lower the flaps, pull the thrusts in reverse, or the plane stops on somebody’s yard of gets stopped by the perimeter fence, PBIA has properly marked lengthy blacktops. Night landing or takeoff here won’t be a problem as the new facility even features glide slope guides, that a pilot can easily land a plane without even looking out the aircraft window. As the last PAL flight from Tagbilaran soars into the dusk, the old city airport also bows out after serving decades as a provincial airport bringing in a huge chunk of Bohol’s development and progress. An identified ace upon Bohol sleeves during the start of the provincial campaign as eco-cultural tourism destination, tourists taking the Tagbilaran Airport are those who do not necessarily go to Cebu, while most Cebu tourists make it a point to go to Bohol. The following day, November 28, air controllers who have resettled in Panglao accepted to runway 03-21 Cebu Pacific flight 5J 619, the first commercial flight that landed in Panglao. The day before, a special inaugural flight of Air Asia flight RPC 8950 flown by Boholano pilots and crew landed in Panglao, the first Airbus 320 which made a historic landing.